Adrian has been sending the rest of us involved in leading worship in All Souls links to a new way of learning fresh songs - watching them on YouTube! Here's a couple of recent ones, one of them from Hillsongs, the other from Chris Tomlin. Those of you who did the Digging Deeper series on Tom Wright's book "Evil and the Justice of God", might be interested in a review (link is direct to it in pdf format) by Don Carson - it's mostly a summary of the contents (no bad thing), but there's a critique too which is worth pondering. An interesting piece in the Guardian online about the takeover of Tescos-and-the-like being like all-pervasive/invasive(?) weeds... "harsh but true???". The stars in fact stand for the thirteen original American colonies. But the arrangement of stars in the symbol was said to secretly spell out the Revelation 13:18 "number of the beast": 666. Without examining the facts, many people, most notably evangelicals, signed petitions against Procter & Gamble and boycotted their products in the 1980s and 1990s. "Without examing the facts..." - I wonder how many times we all get caught out that way? Sorry for the somewhat random nature of the collection... enjoy! A surprising post about the importance of forgiveness in the workplace and (interestingly) how it can generate an atmosphere much more open to the kind of risk-taking that business needs to succeed. Don’t take it all so seriously. My grandfather’s typical response to me, whenever I complained to him about some problem or setback, was: “It’ll all look the same in 10 years time.” As a child, I thought he was just trying to wind me up. Now I agree with him. 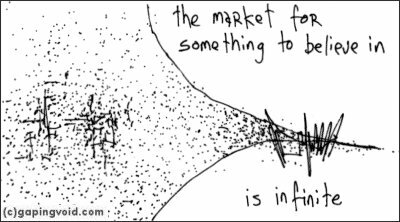 Mostly, the things we get most worked up about turn out to be of zero importance in the longer-term. Meanwhile, we’ve no attention left over to notice those things that are going to change our futures. Accept that some days you’re the pigeon, and some days you’re the statue. “Challenging” is a word used, perhaps, rather too often in reviews of Christian books, but in this case it's more than justified. 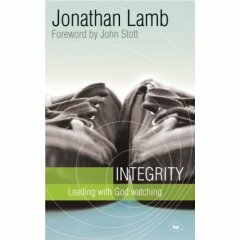 Integrity – leading with God watching by Jonathan Lamb uses the example of Paul's leadership as seen through the lens of his second letter to the Corinthian church to challenge our own notions of leadership and integrity. As Lamb himself points out, most of us are “leaders” in one area or another of our lives – be that in the work, home or church environment – and I can't think of many Christians who wouldn't find this accessible but profound book incredibly helpful – and, yes, “challenging”! A little unjust, you might think. But of course, if he had been the Chief Executive caught with a six-pack of Pepsi on his desk, that would have been another matter. These days, in the new styles of business management, consistency matters. Charles Handy, the business guru, lists as one of his six guiding principles of management, “a leader must live the vision.” He must not only craft his mission or vision statement, he must embody it. We've had a similar story just this past week, with employees of the Royal Bank of Scotland being threatened with disciplinary action if they don't have an RBS account as their main bank. Although it seems petty, it raises those same questions of consistency and integrity – though it makes me wonder whether the top line managers of RBS should have their own personal financial dealings tracked to ensure that they handle their own as carefully and wisely as they are meant to handle ours? For the follower of Jesus, the daily temptation is to compartmentalise faith as “that thing we do on Sunday morning”, rather than a whole-life consistency. Jesus himself was bluntly clear about which was appropriate – and also about which would result in the quality and joy of life we were created to have. The word “integrity” has links with the old Hebrew word “shalom” - both speak of the wholeness of life, where each part of who I am fits into an “integral” hole. When I look at my life today, which parts are out of kilter with the rest? Nice piece today from LICC - it's a special edition of their "Word for the Week", being the 301st edition. They've taken an excerpt from John Stott's "Through the Bible, Through the Year" (available from our bookshop - an excellent way to launch into reading the whole Bible) which connects with the world of work. ...God deliberately humbled himself to need Adam’s cooperation. Of course, he could have done all the work himself. After all, he had planted the garden. So presumably he could have managed it too! But he chose not to. I like the story of the Cockney gardener who was showing a clergyman around his magnificent herbaceous borders, which were in full bloom. The clergyman broke into the praise of God, until the gardener was fed up that he was receiving no credit. ‘You should ‘ave seen this ‘ere garden,’ he complained, ‘when Gawd ‘ad it to ‘isself!’ His theology was entirely correct. Without the human worker, the garden would have been a wilderness. We need, then, to make an important distinction between nature and culture. Nature is what God gives us; culture is what we make of it (agriculture, horticulture, etc.). Nature is raw materials; culture is commodities prepared for the market. Nature is divine creation; culture is human cultivation. God invites us to share in his work. Indeed, our work becomes a privilege when we see it as collaboration with God. I like the "nature" vs. "culture" distinction, but most of all the reminder of collaboration with God. What is there in your life and work today - whether that's at a desk in the city, fixing something on a building site or ferrying your kids to school - that you can recognise as collaboration with God in "making the best" of what he gives us. Nearly three out of every four people in the UK identify themselves as Christian, yet the UK workplace seems decidedly ‘un-Christian’ and distinctly secular. How many of us will be celebrating ‘festive season’ soon? And how many of us have had second thoughts about wearing a cross at work in the wake of Nadia Eweida’s suspension by British Airways and the debate over Fiona Bruce’s necklace? Of course, Christians have long faced tough choices about how they express their faith at work but these recent cases are indicators of a more legalistic and inhibiting environment. How are we to navigate our way through the rapids? It's a moot point how much of this "anti-faith" stuff is going on beyond the pages of the more right-wing tabloids drumming up a rumpus, but I suspect there's a fire to go with the smoke... As always, there's much to chew on. The BBC website gives added fuel to the belief debate by interviewing an "ex-Anglican clergyman" who is now a determined agnostic - followed by a lengthy comment-based 'debate'. Notice of the latest edition of Workwise from the LICC - an online magazine (in pdf format) for those in the world of paid employment seeking to live out their faith with integrity and effectiveness. Meaning, work, hope, belief... done cartoon style. Thanks to Dilbert and to Hugh. Thanks to Jules for his comment on my last proper post before the Summer entitled Spirituality for All? Definitely worth a read and some reflection. A couple of "worth-reads" about work and spirituality - both from LICC. The first is an article by Brian Draper Putting faith to work, reflecting on comments by Jim Wallis at Greenbelt this August about the need to find vocation in the world of work. The second is LICC's monthly Workwise magazine - only available online. There's also a very interesting looking conference coming up organised by CARE called Love Work, Love Life on October 18th (a Wednesday evening). It's very near here at St Mary's Ealing and it would great if a bunch from All Souls were interested in going. More details on the website and we'll have some booking slips at the back of church soon. Let Sue in the office know if you're booking to go so we can link people up. A final thought heading in a completely different direction - I've signed up for the Freecycle newsletters for Hounslow and for Richmond - a daily digest of stuff that people want rid of but would rather someone else had for free than it fill more landfill. Worth doing - you never know what might come your way! Rather less random stuff tomorrow! Few people in the Bible were so clearly sent as John the Baptist. Born after an angelic vision to an elderly father and apparently barren mother, he was destined from birth ‘to be great in the sight of God…filled with the Holy Spirit…to make ready a people prepared for the Lord’ (Luke 1:15-17). It would be presumptuous indeed for us to claim to be sent like John, or like Abraham, Moses or Isaiah – who were specially commissioned to fulfil critical roles in the history of God’s people. Still less for us to claim to be sent like Jesus – whom God sent into the world to bring life to the dead. Perhaps we don’t feel sent when we leave the house in the morning, when we arrive at work, when we take the children to the playground, when we visit a lonely neighbour. But wherever we go – feeling often in a hostile or indifferent world like sheep among wolves - we may bring the sweet fragrance of Christ, like the sudden scent of a rose in a suburban hedge. 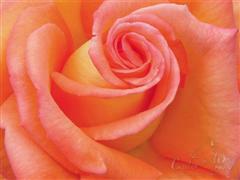 If not John the Baptist, how does "a rose in a suburban hedge" grab you? A big, but manageable, vision of our ordinary "Monday-thru'-Saturday" lives.